Lohagarh is the centrally located fort within the walled city of Bharatpur which was developed with a vision to serve as the capital of a large and powerful Jat kingdom. 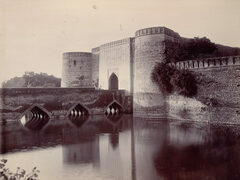 The fort has 30 feet wide and 100 feet high stone walls strengthened by eight bastions and encircled by an inner moat 175 feet wide and 40 feet deep. During the Jat rule the fort had enough ammunition of all kinds and was well stocked with abundant provisions sufficient to last for several months in case of an attack by the enemy. It was with great difficulty that the British could capture the fort in 1826 after the failure of Lord Lake’s famous siege of 1805. The fort had within it imposing and attractive palaces, baradaris, havelis, temples, gateways, gardens and other ancillary structures.